When reader and commenter Matthijs wrote me to ask if I had knowledge of any important copyright legislation in Europe, I was admittedly at a loss. As a United States citizen dealing with copyright on a Web hosted mainly within my own country’s borders, I was only used to dealing with U.S. copyright law. However, I quickly realized that, as the Web becomes increasingly globalized, this U.S.-centric attitude toward copyright will become obsolete. International treaties and foreign copyright policy will become much more important in the coming years. (EU). With 25 member states and an estimated 460 million in population, the EU will likely become a driving force behind much of the Internet, including copyright enforcement. Furthermore, while it is very similar to U.S. copyright law and much of copyright law has been standardized by means of international treaties, there are still some important differences to note. Thus, over the next few weeks, we’re going to take a look at EU copyright law and compare it to that of the United States in order to gain a better understanding of it. 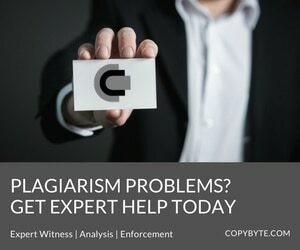 The first area topic of discussion is the notice and takedown provision that so many use when dealing with plagiarism and content theft online. The infringing materials and their Internet location, or if the service provider is an "information location tool" such as a search engine, the reference or link to the infringing materials. While the DMCA requirements might seem complicated and intimidating, especially to laypeople like myself, they do create a set of safeguards that deter abuse. First, the system prohibits third-party abuse complaints. Only the copyright owner or someone authorized by them can file a complaint. Second, it offers a punishment, the penalty of perjury, for lying while filing a DMCA notice. Third, it ensures that the infringing works are properly identified and that some evidence is provided to the infringement. Finally, and perhaps most importantly, it offers a putback procedure that enables Webmasters hit with obviously false DMCA notices to get their sites put back within ten days. While this is not a perfect solution, it does do a great deal to deter fraud. By contrast, the framework for the European notice and takedown provision is laid out in the European Directive on Electronic Commerce (EDEC) (link PDF). The EDEC, unlike the DMCA, is not a pure copyright law. It deals with many issues of electronic commerce including electronic contracts, spam and dispute resolution. Articles 12-14 of the directive deal with liability of service providers. Articles 12 and 13 remove all liability for providers that are “mere conduits” of information or are simply engaging in caching. The article itself sets no specifications as to what format a notice of infringement should take, who is able to send one or what information is required. There are no listed penalties for filing a false report, no guidelines for putting back falsely removed content and no requirements to adequately identify infringing works. In short, the main difference between the U.S. and the EU on matters of notice and takedown is that the EU removes all of the formalities that exist under U.S. law and, with them, all of the protections. A 2004 study on EU Notice and Takedown procedures (link PDF) found that 70% of hosts complied with a generic request to remove an article that was clearly in the public domain (the author had been dead for nearly 120 years). This is despite the fact that the sender was using a free Hotmail account and writing on behalf of a fictitious organization. Of the hosts, only one looked at the page and questioned the validity of the complaint. Another simply did not respond to the queries and a third only denied the request because of the nature of the sender’s account. This raises understandable concerns for free speech activists that worry the provision could be used to unjustly shut down sites that carry unpopular speech. However, for people fighting content theft and plagiarism, this means that, when dealing with European hosts, there are very few specifics one needs to follow. Generally, an informal letter to the abuse department of the respective host should take care of matters. Despite this, I still would encourage anyone with a copyright complaint to include much of the same information that one would find in a regular DMCA notice including titles of the works involved, specific infringing links and links to original works. While you don’t need the legalese of a full DMCA notice, providing background and evidence is always helpful to a host, no matter what the country. In the end, the most difficult obstacle to overcome when dealing with EU hosts will most likely be the language barrier. With so many languages spoken within the EU (twenty are listed on the EU homepage alone), almost no one can read and write them all. Even though copyright translates well across most borders, especially in the EU, finding who to write regarding infringement and sending them a letter that they can understand is often a difficult challenge. This is an area that, while Babelfish can help, more needs to be done. Regardless, as understandably controversial as the EU directive on the subject is, it undoubtedly bodes well for copyright holders, especially those dealing with copyright infringement online. Though it goes well beyond what U.S. law does, those familiar with the U.S. law should have no trouble working within the EU, at least as far as the law is concerned.